I just realised that I’d shared pictures of the fondant decorations I made for my nieces ladybird cake, and had shown the process of baking the cake, but had completely forgotten to write a post on how the finished product turned out! So I’ll fix that right now! My brother and his family live right at the tippy top of the state, so we were meeting in the middle (kind of!) for a family holiday in Broome, staying at the wonderful Cable Beach Club Resort. Wow, I’d never had a resort style holiday before, and now I think I’ve been completely ruined for future holidays!! Talk about getting away from the real world for a while! But back to the topic at hand. I can share holiday snaps another time! We travelled to Broome by plane, which was an interesting way to get a cake to a party! I double wrapped then froze the layers of the cake once they were cool to give it a better chance of surviving transportation. I also didn’t think I’d be able to successfully whip up a batch of buttercream icing in our accommodation, so I made it at home the night before we left, and refrigerated it until it was hard as a rock! I put it all in an insulated bag with freezer bricks, and off we went. Thankfully it all made it to Broome in one piece – well three pieces actually, but that was the way it was meant to be! Luckily we were the first to arrive, so I had time to put it all together ready to surprise the birthday girl. The kids were all very excited about the cake and the party away from home. 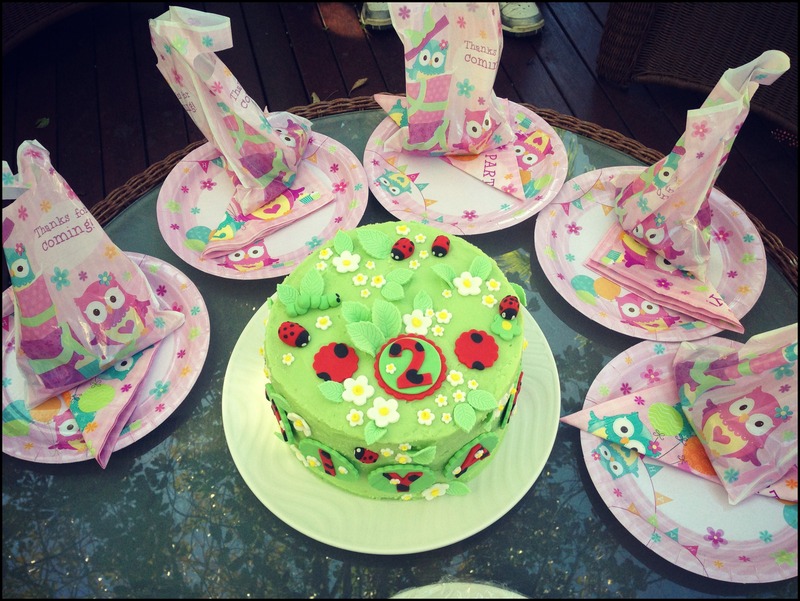 I’m not sure that the hooty owl plates really went with the ladybird theme, but that’s what happens when you forget to organise party decor!! How on earth did you get the ladybugs inside the cake! Would love to try it! Love the cake! I’m going to attempt a similar one for my daughters 3rd birthday, sans plane trip to Broome.